The day's racing: Here's the organizer's summary. 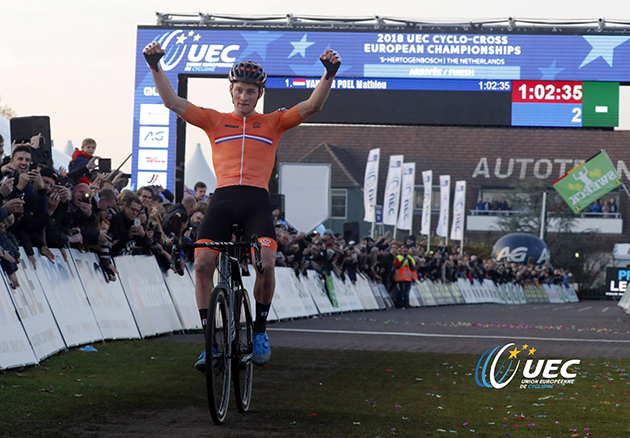 A year after his win in Tabor, Mathieu van der Poel (Netherlands) affirmed his Cyclo-Cross European Champion title. The edition that was raced today in ‘s-Hertogenbosch (Netherlands) watched by a crowd of 10.000 was a highly technical event with four gold medals won by Dutch riders. Van der Poel, silver medallist this year at the Glasgow Road European Championships had practically no opponents and launched a decisive attack in the second of the nine laps raced, against the World Champion Wout van Aert (Belgium) who could do nothing other than stay in second place. Another Belgian stepped on the third step of the podium, Laurens Sweeck. The long day in ‘s-Hertogenbosch began with the Men Juniors race dominated by Pim Ronhaar (Netherlands) who achieved a solo win beating the Belgians Witse Meeussen and Thibau Nys. 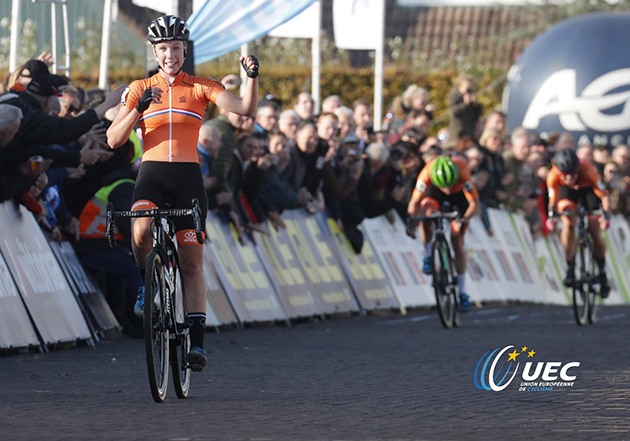 There was an all Dutch podium in the Women’s Under 23 with the solo victory of Celyn Del Carmen Alvardo ahead of Inge van der Heijden and Fleur Nagengast. Like last year, the Under 23s race focused on the battle between the British rider Tom Pidcock and the Belgian World Champion and current European Champion Ely Iserbyt. Pidcock controlled the race right from the start by attacking and then won in solo beating Iserbyt. Third place went to the Frenchman Antoine Benoist. The Women’s Elite race was particularly exciting with Dutch riders also making their mark here. Immediately after the start, a breakaway group with Marianne Vos, Annemarie Worst, Denise Betsema, dominated a large part of the race together with the Belgians Ellen van Loy, Sanne Cant and Loes Sels. In the final stages, the young Annemarie Worst launched a decisive attack, managing to cross the finish line only 2” ahead of Marianne Vos and Denise Betsema. Rocco Cattaneo, President of the Union Européenne de Cyclisme: "In ‘s-Hertogenbosch we have enjoyed a great event and not just in sporting terms. The extensive TV coverage, the public who attended the races and the perfect organisation of the event confirms that today we have witnessed a true change in the discipline of Cyclo-Cross. The format that we introduced appears to be working and in the future we are planning other initiatives that will ultimately strengthen the position of Cyclo-Cross in the international cycling movement. One of the new features is without doubt the creation of a European title for the Women Juniors which will be awarded for the first time next year at the continental event that will be held in Silvelle (Italy) on 9 and 10 November." Mathieu Van der Poel finishes nearly a quarter of a minute ahead of his nearest chaser.